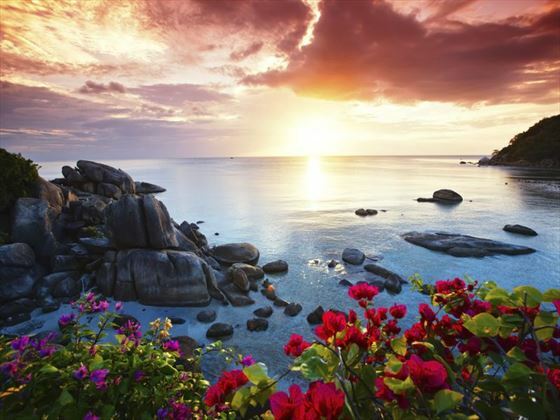 Rich culture, stunning beaches, luscious rainforest, majestic temples…Thailand truly has it all. Discover everything this eclectic destination has to offer on this fantastic 14-night tour. 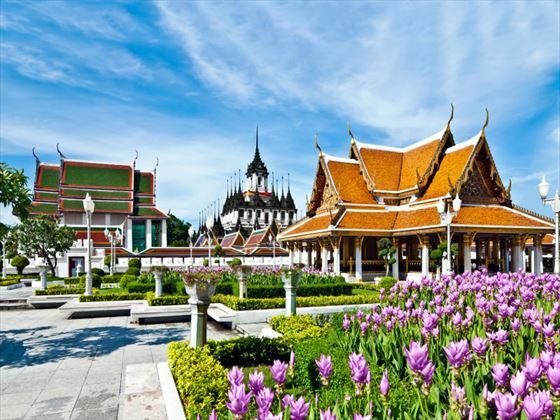 Starting and ending in Bangkok, you’ll discover bustling cities, peaceful beaches and dense rainforest, all the while enjoying a plethora of unique activities. 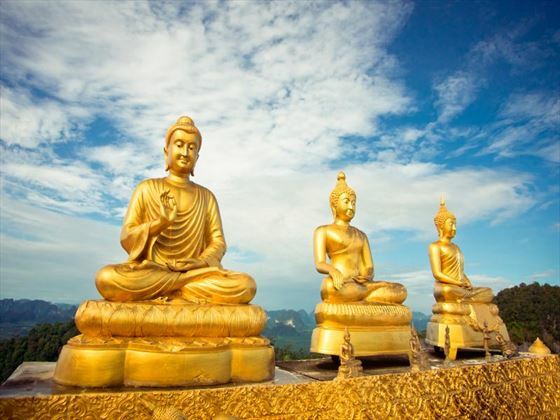 Explore beautiful Buddhist temples, wander through the ruins of Ayutthaya, sail along the Chao Phraya River, cook authentic cuisine with a local chef, and indulge with a spot of relaxation in Koh Samui on this epic trip across Thailand (GA - ATHNG). Upon arrival in Bangkok, you will be transferred to your hotel for a welcome meeting. Before the meeting, you might have time to explore. Today you will travel to Kanchanaburi. 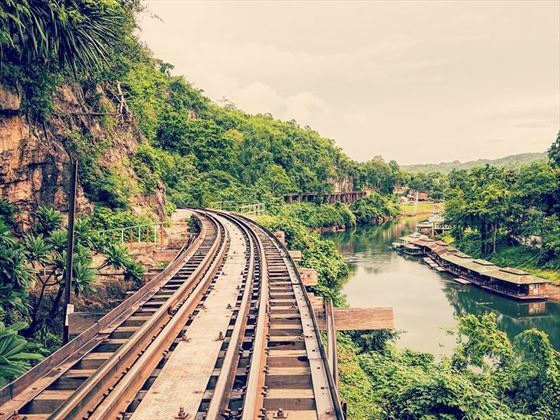 Home to the ‘Bridge on the River Kwai’, you will enjoy a train journey over the bridge and immerse yourself in this piece of World War II history. 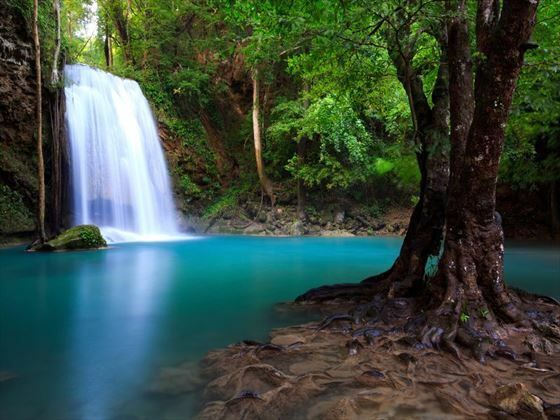 You’ll rise early today, heading to Erawan National Park to see its cascading waterfall, before visiting the Thai/Burma War Museum and War Cemetery for a dose of history. In the afternoon, you’ll travel to Ayutthaya for a delicious Thai dinner on a converted 1930s rice barge. Today you will explore the ruins of Ayutthaya, a fascinating UNESCO World Heritage site that served as Thailand’s capital from the 14th to the 18th centuries. Once one of the most magnificent cities in the world, this is certainly an interesting excursion. Afterwards, you will travel back to Bangkok for your flight to Chiang Mai. Begin the day with a visit to the local markets with a chef, before getting together and enjoying a Thai cooking class at a private culinary school and tucking into your creation for lunch. 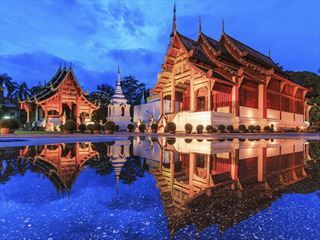 Afterwards, you’ll visit the notable Wat Chedi Luang Buddhist temple that resides in the heart of Chiang Mai’s old city. Here you’ll have the incredible opportunity of meeting one of the young Monks to discuss their daily life and Buddhism. 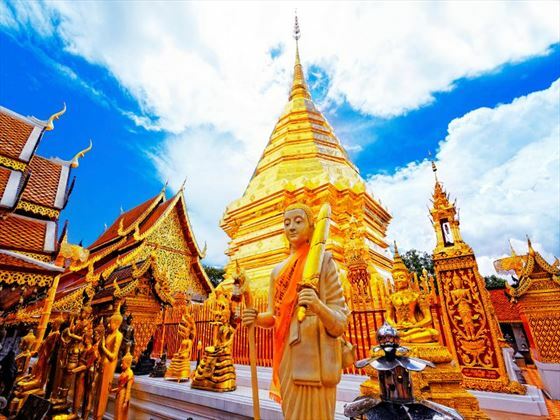 Next up is a visit to Doi Suthep Temple, a golden Buddhist temple reached by 300 steps and adorned with sacred relics and a white elephant shrine. Here you’ll be given the chance to listen to monks chanting whilst taking in stunning views. If you have enough energy after the 300 steps, you have the option of enjoying a bike ride through the city. The daytime is free to explore Chiang Mai as you wish. A mecca for shopping and handicraft production, you may want to hit the shops. Later on, you’ll travel to the countryside, visiting a village just outside Chiang Mai and sitting down to a delicious Khantoke dinner in the home of a local family. Sticky rice, crispy pork with chilli paste, hang-le curry…you’ll be introduced to a variety of flavours during your stay. Afterwards, you’ll have the opportunity to talk to locals and learn more about their lifestyle. 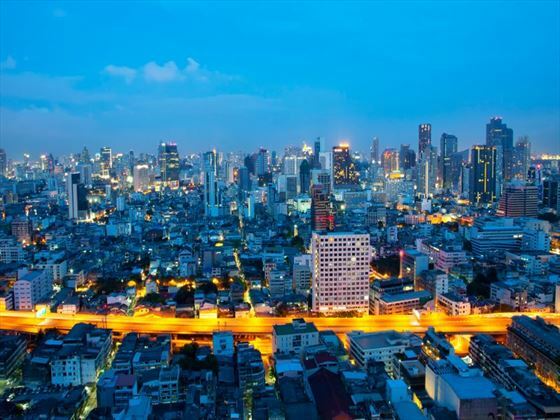 Begin your day with a flight back to vibrant Bangkok. Once there, you’ll board a longtail boat and cruise along the bustling Chao Phraya River, winding through small klongs (canals) and marvelling at amazing skyscrapers and temples. The afternoon will be spent visiting Wat Po, known for its reclining Buddha with feet shrouded in mother-of-pearl engravings of Buddhist symbols. This is even the birthplace of traditional Thai massage. The day is free for you to explore this eclectic city. 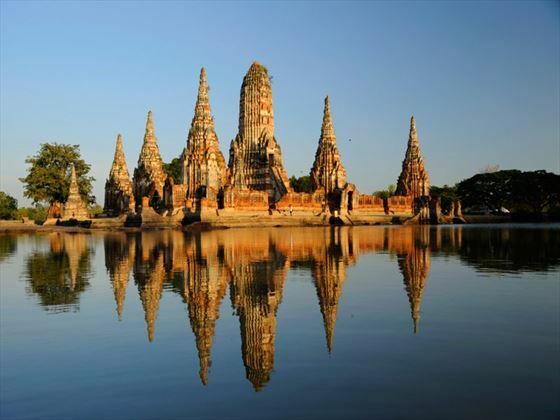 Visit extravagant temples, wander through interesting museums, indulge in a Thai massage, or hit the shops. Today you will catch a flight to the tropical island of Koh Samui, a beautiful beach destination that offers everything you could possibly want in a beachside getaway – pristine beaches, gently swaying coconut palms, and delicious seafood caught straight from the azure waters. Your hotel will be nestled in the Chaweng district, a colourful hub of restaurants, entertainment and shopping. After breakfast, you’ll board a longtail boat and sail beyond the beaten track to the unspoilt islands of Koh Madsum and Koh Tan. Tuck into delicious local cuisine on the beach for lunch, and spend your afternoon leisurely kayaking or snorkelling. In the morning, you will catch the ferry back to the mainland before driving to Anurak Community Lodge just outside Khao Sok National Park. This charming lodge focuses on environmental sustainability, and your trip here will show you their impressive work with the local community. Once the evening appears, you’ll embark on a rainforest walk with a community guide and enjoy a lovely campfire dinner under the canopies. 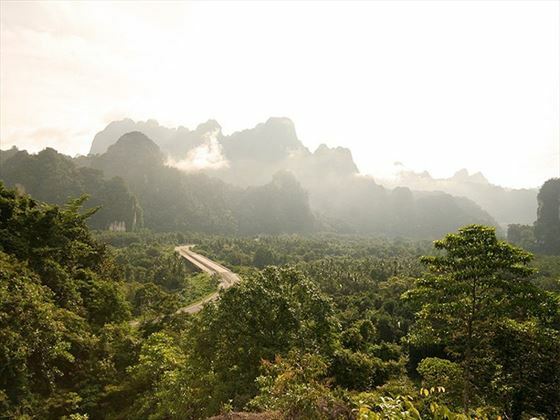 Your walk through Khao Sok rainforest will grace you will amazing views of the evergreen flora and limestone karst cliffs, whilst your guide will tell you all about the natural medicines made here. The day is free for you to enjoy at your own pace. This beautiful national park is brimming with fantastic activities, including jungle treks, relaxing in the hot springs, bike tours, and canoe tours. The morning will be spent driving to Krabi. Once there, you’ll board a longtail boat and cross the river, passing mangrove forests and exploring the Khao Khanab Nam caves along the way. Once you’ve arrived on Koh Klang, you’ll jump in tricycle tuk-tuks and discover the local communities and rural industries – including a rubber plantation, rice fields, and a batik workshop. 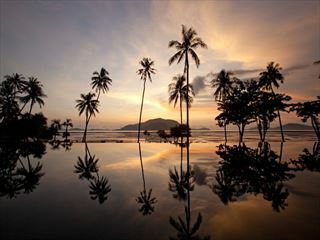 You’ll then have time to relax at Aonang or Noppharat Thara Beach, or you could stay at the resort and sip cocktails by the pool. The whole day is free for you to continue relaxing on the beach. 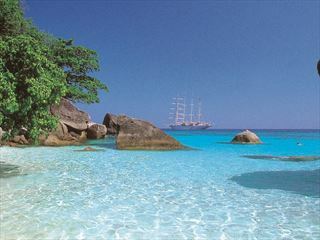 Be sure to try a bit of snorkelling – the marine life here is incredible. Return to Bangkok, where your tour will end.